Bath shower screens, also know as bath screens, prevent water from escaping onto the bathroom floor when you're having a shower. They come in a range of styles including square, curved, sail and folding bath screens. 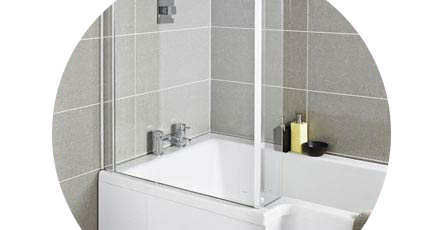 Choose from a variety of bath screen fittings including fixed screens, hinged or sliding bath shower screens for your own personal taste and preference. Bath shower screens offer a more stylish alternative to shower curtains and they are also much more robust. Not only are they a practical addition, but choosing a screen which complements your bathrooms style is a great way to give it a bespoke feel. Very nice screen and helps to keep the bathroom floor dry.